Likewise, very little is known about the Paleogene avifaunas of Australia, and most fossil birds from this period were described after the reviews by Vickers-Rich (1991) and Boles (1991). The continent has no Paleocene fossil record of birds, and the only Eocene avian specimens stem from the deposits of the early Eocene Tingamarra Local Fauna near Murgon (Queensland), whose sediments are of flu-violacustrine origin and have a minimum age of 54.6 million years (Boles 1999). The Oligocene fossil record is more comprehensive, and a fair number of late Oligocene bird fossils come from the Riversleigh Formation in Queensland. The more than 200 named sites of this locality were deposited in large lakes, shallow pools, and caves, and cover a wide stratigraphic range, from the late Oligocene into the Neogene (Boles 1997a, 2001a, 2005a). The described fossil birds include both aquatic and terrestrial taxa. 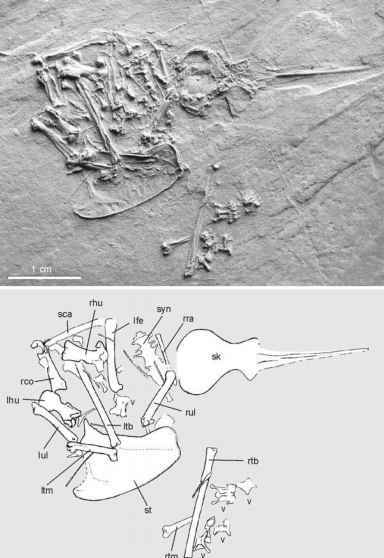 Late Oligocene (24-26 Ma) birds were also found in the Lake Eyre Basin from the Namba and Etadunna Formations in South Australia, whose sediments were deposited in a primarily lacustrine environment and yielded remains of the Casuariidae, Anatidae, Accipitridae, Rallidae, Burhinidae, Palaelodidae, Phoenicopteridae, and Columbidae (Boles 2001b; Worthy 2009). Unlike in the abundant Quaternary fossil record and except for penguins, Paleogene birds are also rare in New Zealand (Worthy and Holdaway 2002). The Eocene and Oligocene localities where penguins have been found were summarized by Simpson (1971). More recently, well-preserved remains of fossil stem group representatives of the Sphenisciformes were found in the Paleocene (ca. 58-61 Ma) Waipara Greensand (Slack et al. 2006). The Paleogene record of neornithine birds from Antarctica was reviewed by Tambussi and Acosta Hospitaleche (2007). Most specimens come from Seymour Island. Except for one Paleocene record from the Cross Valley Formation (Tambussi et al. 2005), these were found in the early and late Eocene of the La Meseta Formation, which was deposited in a nearshore deltaic environment (Tambussi and Acosta Hospitaleche 2007).